Garlic (Allium sativum) is a member of the onion family, also known as “Poor Man’s Treacle” and “Stink Plant”. Cultivated world-wide, it is one of the strongest flavoured perennial plants used in food. Bulbs consist of numerous bulblets, known as cloves, enclosed within a whitish skin. Once removed from the outer skin, they can be separated and sown in a sunny position, to grow. According to some herbals, garlic originated in central Asia and has likely been in cultivation for thousands of years, as mentioned in the Hebrew scriptures of the Bible. Contains natural antiseptic, antibiotic, anti-bacterial and anti-viral properties. Stimulates the activity of the digestive organs, relieving problems associated with poor digestion. Useful for chronic stomach and intestinal disorders, and regulating the action of the liver and gallbladder. For all lung and respiratory ailments, such as chronic bronchitis, respiratory catarrh, recurrent colds and influenza. Has a beneficial effect on blood circulation and heart action, helping to normalise blood pressure, lower cholesterol and counteract arteriosclerosis. An excellent source of Vitamin C, it is renowned as a powerful immune-enhancer. A cold extract or tea made of garlic can be used as an anti-fungal enema for intestinal worms, particularly pinworms and bowel infections. 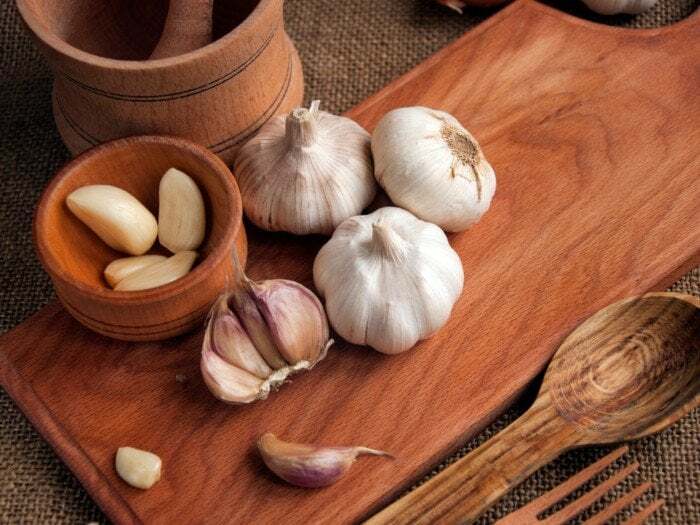 An old herbal recommends “Wine of Garlic” for baldness (macerated garlic in spirit), and crushed garlic mixed with lard, makes an excellent ointment for skin problems. One clove of garlic, eaten three times daily, aids and supports the body in ways that no other herb does. It is best to use fresh garlic or extract oil—prepared by peeling and mincing raw garlic, and covering with cold-pressed olive oil. Tightly seal the container, leave to infuse for 3-7 days, shaking each day. Strain the extract into a dark bottle, store in a cool place and take 1 tsp of this oil, several times per day. People who consume garlic often worry about having pungent breath but you can lessen the aroma by chewing fresh parsley, eating a raw apple or, as Culpeper tells us, by chewing a few cumin seeds. At the end of the day, the positives far outweigh the negatives and you will never be bothered by vampires!